No doubt The Jew of Malta’s first audiences, at the Rose Theatre in the 1590s, would have had few misgivings about laughing at Barabas, Marlowe’s title character, and enjoying his downfall. Jews were an easy and accepted target for satirical humour. Barabas would also have been recognisable as a version of the comic Vice figure in morality plays and Tudor interludes. Finding the right tone now is more difficult. Director Justin Audibert does not pull any punches regarding crude anti-Semitism – there is a lot of spitting by Christians and making fun of supposed Jewish body odour and big noses – but there are surprisingly few laughs. Everything depends on the interpretation of Barabas. 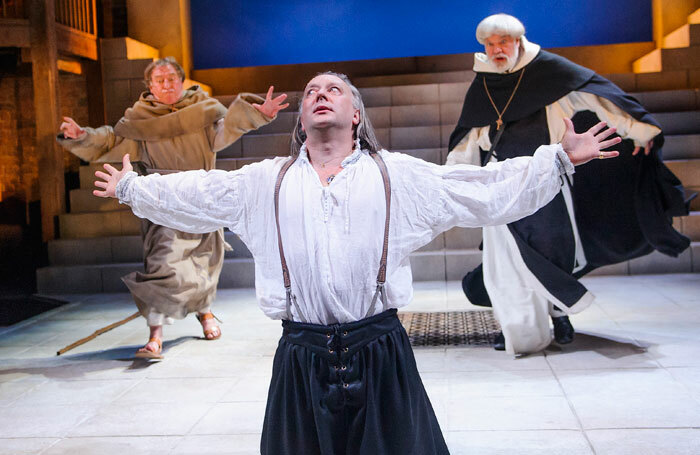 Jasper Britton, a memorably fraught Henry IV in the recent RSC productions, has shown his skill at neurotically complicated comedy elsewhere, in Private Lives at Hampstead and Mother Adam at Jermyn Street among others. Here he is an attractive, energetic villain but, given the opportunities for making the audience complicit in the thrust-stage Swan, there might have been more Richard III-style wicked glee as murder follows elaborately plotted murder. The elimination by poisoned porridge of a convent of nuns including Abigail (sincere Catrin Stewart), his previously beloved daughter (she has become a nun after her father caused her two suitors to kill each other) is the most heinous. The death-by-lethal-posy of Barabas’s servant Ithamore (gung-ho Lanre Malaolu), a thieving courtesan and her lover does border on the risible, however. The production opens with Machiavel (Simon Hedger smiling in modern gear, including a T-shirt sporting a jokey RMC motif) declaring that those who condemn Machiavelli are also his enthusiastic followers – we are all implicated. But this is followed by Barabas, not gloating in his counting house but performing a lengthy religious ritual. Villain he may be, but he’s being given some justification for his actions. Lily Arnold’s effective set is simple: solid stone steps lead down to a flagged floor in which is set a trap covered by an iron grille. A rectangular basin of water suggests purity and is useful for enforced baptism and ritual cleansing. In contrast, the period costumes are sumptuous, many in glowing greens, reds and purples, the Turks in elaborate turbans and upturned shoes. The music – sacred Christian songs or festive klezmer – played and sung live, is simply glorious. Marlowe condemns all hypocrisy, especially the kind that hides behind religiosity, and that is certainly clear here as venal Christians and greedy Jews look after their own interests when threatened by Turkish invasion. T S Eliot described this piece as “tragic farce”. To play just for laughs would do Marlowe a disservice, But, while Audibert and his company have honoured modern psychological nuances, the farcical element is disappointingly watered down.